Content that is primed for virality is created with the goal of triggering social sharing and publisher placements. It’s designed to catch mass attention. All across the world, digital content is being published at a rapid rate. Millions and millions of stories are propelled into the world with the hope that even just a small group of the billions of eyes on the internet will see it. And every once in a while, a piece of content succeeds. It attracts attention, then more attention, and even more attention – and it goes viral. Content is considered viral when it receives massive attention and is rapidly spread by audiences and publishers. We’ve all seen viral content. It’s the story that pops up in your social stream once, twice, and a third time. And then you finally click to experience it for yourself and share it, furthering its viral journey. Viral content pushes its way to the top of the internet because it is exponentially shared. It has a high viral coefficient, which means a large percentage of those who viewed the content shared it. How does this happen? What makes content stand out and get shared by the masses? Much of why a piece of content goes viral has to do with the content itself. The content is primed for social sharing because it encompasses elements that people enjoy and respond to. But regardless of the characteristics of the content, all viral content gets shared across the internet because of two things: social sharing and media attention. Content goes viral when it is widely shared on social networks and covered by websites that have large audiences. Stories are discovered on websites and social feeds, and they are spread by the readers who share them. Knowing that these key factors drive virality, we have created a process that positions our campaigns to get more attention and improves the likelihood that they will go viral. Once we create a piece of content primed for virality, our digital PR specialists seek out high-profile placements on popular websites. To get maximum initial visibility, we reach out to high-authority websites and make them aware of our content. The goal is to get them to cover the story on their site so we can get exposure to a large audience. If we’ve done a good job at creating compelling and shareable content, acquiring a decent PR placement is usually enough to trigger widespread social sharing and syndication that is a hallmark of viral success. Fractl employed this process for one of our most successful campaigns, Perceptions of Perfection. We created content primed for social sharing. The campaign featured versions of the same picture Photoshopped by designers in 18 countries across the world. It was a shocking and surprising graphic depiction of the problem with Photoshopping and body expectations – a trending and emotionally powerful topic. We launched the campaign by getting strategic placements and coverage on high-authority websites with large audiences. One of the earliest placements was BuzzFeed. Huffington Post was also one of the campaigns earliest features. With placement on high-authority websites and maximum initial visibility, a campaign has many eyes on it, which creates a big opportunity for social sharing. If the content is properly primed for virality, it will begin to spread across the web. For content that has a high viral coefficient (a large percentage of those who read it will share it), we usually see massive amounts of social sharing and syndication (more than 10K “likes,” sometimes up to 100K “likes”). We also see a variety of pickups on sites outside of the exclusive placement (usually more than 50 other pickups on a successful viral campaign). Our initial placements for the Perceptions of Perfection campaign succeeded in sparking social interest and attention for the campaign. The stories on BuzzFeed and the Huffington Post were widely shared, as was the original on-site story. The campaign earned close to 1 million social shares, with nearly 20 percent coming from on-site shares. Additionally, the campaign was shared by several celebrities, including Sofia Vergara and Lil Wayne, who both have millions of social media followers. Pick-ups and coverage by high-authority publishers initially launch content into the sharing spectrum. Then, widely shared content comes back around to catch the attention of even more publishers. When publishers see a popular story, they jump on the trend. They want to capitalize on its popularity by covering it on their website. This leads viral content to get even more attention through syndication, further spreading its reach online. At this point, we generally consider a campaign a viral success if it has large amounts of user engagement and widespread syndication. It only took one week for the Perceptions of Perfection campaign to catch the attention of other publishers and start popping up all over the web. The campaign earned placements with The New York Times, Yahoo, Mashable, Bustle, Mic, Business Insider, Gizmodo, Marie Claire, E! Online, and The Telegraph. It even gained attention from international publications and traditional media outlets. The story was featured on Business Insider Australia, CNN Espanol, six additional versions of the Huffington Post, and even a spot on a Canadian morning show. Strategic Media Coverage on high-authority websites with a large audience. Social Sharing fueled by a large audience and content primed for virality. Syndication that further spread the content to new audiences and even more social sharing. The campaign resulted in nearly 600 placements, more than 900,000 social shares, over 3 million views on the BuzzFeed article, and just shy of 700,000 page views for the client site. The campaign was a viral success. It went through the right phases that allowed the content to catch mass attention and get spread across the internet. This was the result of proper planning and placement, but it also had a lot to do with the content. For content to go through this process successfully, it needs to be primed for virality. Like the path of launching viral content, the process for creating viral content isn’t guaranteed or set in stone. But there are some best practices that have been proven to create results. At Fractl, we have found that there are common characteristics in content that gets a high number of placements and shares. 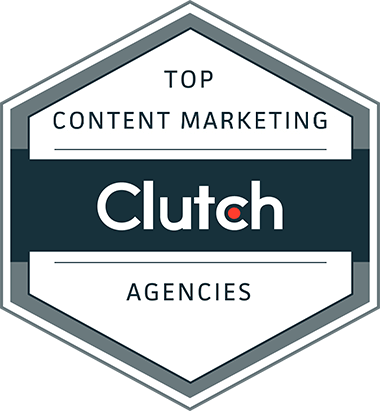 Fractl performed a study that looked at the characteristics of our content that received the most placements. By analyzing 345 campaigns, this is what we discovered. Content that fit into these categories was more likely to catch the attention of publishers and get covered on websites. 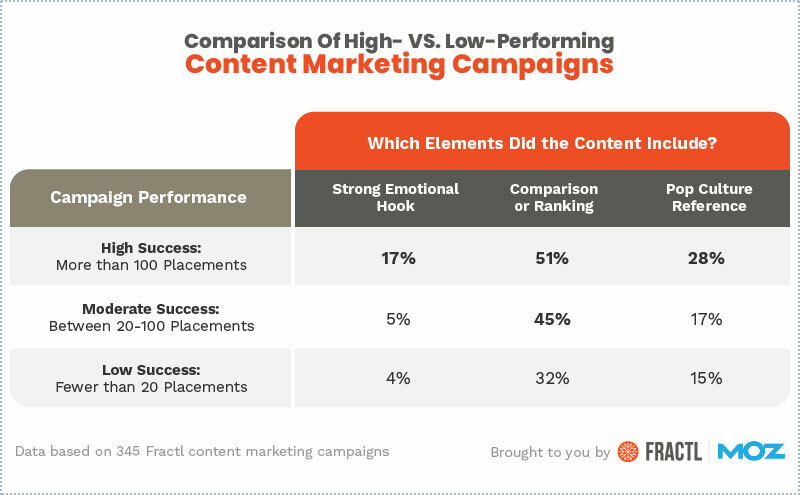 Out of our campaigns, content that included comparisons or rankings received the highest number of placements; content that included a strong emotional hook was also likely to get a lot of coverage. Creating content that is likely to get placements is vital to creating viral content, as the placements are what catches the initial attention and can contribute to someone being more likely to share the story on their social media pages. Perceptions of Perfection was successful at getting placements – it received over 600 placements – because it met almost all of the criteria of content popular with publishers. The content was highly emotional. It incited a strong emotional reaction as audiences saw the striking differences in the Photoshopped images. The content had broad appeal. It was interesting to both male and female audiences of all ages and even audiences in other countries. The content included comparisons. It was positioned to make 18 interesting and visual comparisons. While the content lacked a pop culture theme, it did include a trending theme. 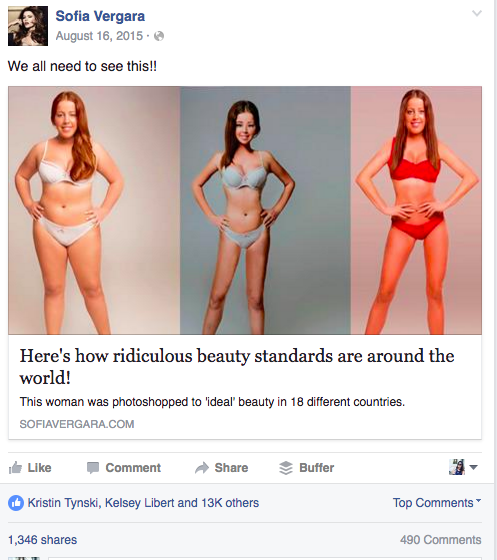 Photoshopping and body image are hot topics, which likely helped lead to the high placement rate. To discover why certain pieces of content are shared more than others, Fractl conducted two research studies. One identified the emotions that ignite content. The other looked at what emotional combinations make people share. Content that creates a positive emotional experience is shared more often than content that creates a negative emotional experience. Pairing contrasting emotions often drives sharing. An element of surprise effectively grabs the attention needed to begin the sharing process. High arousal and low dominance emotions drive discussion, which is important for social spreading. High dominance emotions are tied to social sharing. Emotionally driven content is an important ingredient in viral content, and how the emotions are used also impact how successful the content will be at being shared. The “Perceptions of Perfection” campaign received almost 1 million social shares because it was infused with emotional appeal and it used emotional angles in the right ways. The content used contrasting emotions. It was, at first, amusing and interesting (as audiences saw the variety of designs), then it became shocking and angering (as audiences saw the idealized beauty standards presented by each country’s designers). The content had an element of surprise, which was that the same image looked drastically different depending on the designer. The content triggered high arousal dominance emotions (excitement and anger) that made it a good topic for social conversations. Emotional appeal in the Perceptions of Campaign targeted the right feelings to inspire audiences to take notice, share, and discuss – which all helped the campaign on its way to becoming a viral hit. Every day, millions of pieces of content are sent out to the online world. Sometimes, one of those stories breaks through the clutter, catches mass attention, and goes viral. While there is no exact science that says why or how this happens, there are themes and commonalities that appear in the process. At Fractl, we use these trends and patterns to create content that is primed for sharing and placements; our strategic promotion plans send content on a path most likely to create a viral story. See how we have used our process to create other widely shared and covered content campaigns by browsing through our case study library or reading our free content marketing research studies.